Who Would Buy This: Those shopping for a round glass dining table. The 5pc Contemporary Cappuccino Finish Round Glass Dining Room Table & Chair Set is comprised of 1 table and four dining chairs. The 45″ diameter of the table makes this a great choice for anyone living in an apartment or if you have a small dining room or nook. The contemporary detailing of this set which includes glass, metal and wooden finishes and an 8mm beveled edge table top, makes this dining set difficult to beat in this price range. The quality of this table and chair set is surprising and it is always good to know that the chairs are solid and sturdy – it is not just all about good looks! But speaking of looks, this modern set will compliment any number of design and color schemes. Whether you are going for a sophisticated look, city chic or even contemporary casual this set will work well. The neutral finishes means that this glass dining table set will fit in regardless of your color scheme or if you are redecorating, you can be sure that your decor and color choices won’t be limited by your choice of furniture. 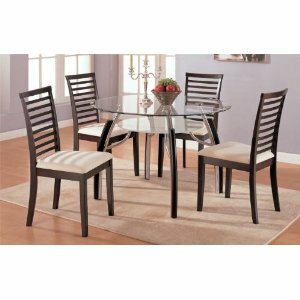 While this is a self assembly dining room furniture set it is easy to assemble. I have assembled a number of items over the years that virtually require an engineering genius to figure out, so I am used to this aspect of dealing with flat packs, however in this case I have read a number of reviews of this product that actually make a point of commenting on the ease of assembly including one that stated that “assembly was a breeze”! The packaging includes Styrofoam that will need to be disposed of. While this can be an inconvenience, I would rather it arrived in perfect condition and I know that packaging is required for protection. Value for Money: The 5pc Contemporary Cappuccino Finish Round Glass Dining Room Table & Chair Set is currently (at time of writing) on offer at 51% discount and this makes it exceptional value. This round glass dining table and chair set is available from Amazon. 10 Cool Housewarming Gifts for Less Than $25!